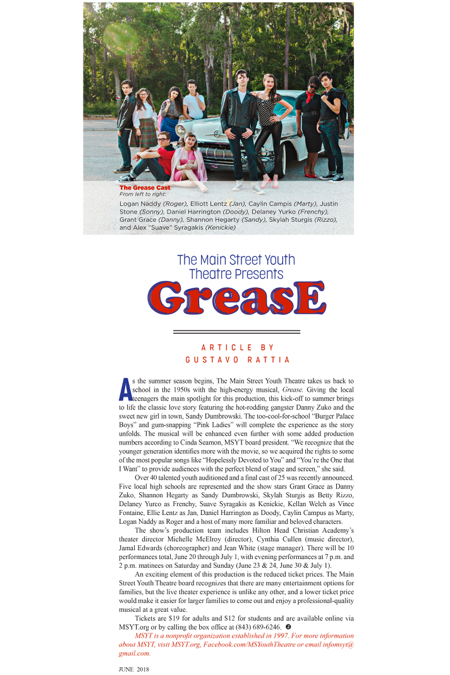 As the summer season begins, The Main Street Youth Theatre takes us back to school in the 1950s with the high-energy musical, Grease. Giving the local teenagers the main spotlight for this production, this kick-off to summer brings to life the classic love story featuring the hot-rodding gangster Danny Zuko and the sweet new girl in town, Sandy Dumbrowski. The too-cool-for-school “Burger Palace Boys” and gum-snapping “Pink Ladies” will complete the experience as the story unfolds. The musical will be enhanced even further with some added production numbers according to Cinda Seamon, MSYT board president. “We recognize that the younger generation identifies more with the movie, so we acquired the rights to some of the most popular songs like “Hopelessly Devoted to You” and “You’re the One that I Want” to provide audiences with the perfect blend of stage and screen,” she said. Over 40 talented youth auditioned and a final cast of 25 was recently announced. Five local high schools are represented and the show stars Grant Grace as Danny Zuko, Shannon Hegarty as Sandy Dumbrowski, Skylah Sturgis as Betty Rizzo, Delaney Yurco as Frenchy, Suave Syragakis as Kenickie, Kellan Welch as Vince Fontaine, Ellie Lentz as Jan, Daniel Harrington as Doody, Caylin Campus as Marty, Logan Naddy as Roger and a host of many more familiar and beloved characters. The show’s production team includes Hilton Head Christian Academy’s theater director Michelle McElroy (director), Cynthia Cullen (music director), Jamal Edwards (choreographer) and Jean White (stage manager). There will be 10 performances total, June 20 through July 1, with evening performances at 7 p.m. and 2 p.m. matinees on Saturday and Sunday (June 23 & 24, June 30 & July 1). An exciting element of this production is the reduced ticket prices. The Main Street Youth Theatre board recognizes that there are many entertainment options for families, but the live theater experience is unlike any other, and a lower ticket price would make it easier for larger families to come out and enjoy a professional-quality musical at a great value. Tickets are $19 for adults and $12 for students and are available online via MSYT.org or by calling the box office at (843) 689-6246. MSYT is a nonprofit organization established in 1997. For more information about MSYT, visit MSYT.org, Facebook.com/MSYouthTheatre or email infomsyt@gmail.com.